My husband has what I consider to be a Very Hard Job. An Important, Stressful, Extremely Fulfilling job. He would never say this to me (unless he were joking or drinking too much), but the work I do now isn’t exactly change-the-world material. I could have made a good argument for that before, when I was covering hard news for the newspaper and upholding the First Amendment and bringing to light Important Things and all. I’m still adhering to the same ethics and fighting for freedom of the press (without which you can kiss democracy and freedom and truth goodbye, by the way), but let’s face it. The journalism I’m doing now is about amazing architecture and trendy food and how to make chocolate Easter bunnies. I love it. It’s fun. I’m lucky to be doing it. But nowhere in my current job description does it mention getting homeless children off the streets or helping an abused kid graduate from high school. So what does this have to do with crafting? I’m not going to say I think crafting can change the world (I’m not going to say it can’t, though), but I do believe that sewing and making and painting and beading are larger than the sum of their parts. Creating art and crafts slows us down. It connects us with our ancestors. It stirs up pride when we use our own hands to create, rather than mindlessly buy, buy, buy. Host Jennifer Ackerman-Haywood (a journalist herself) interviewed Kimberly Winston (also a journalist. We’re multiplying like bunnies. Look out), who wrote a book called “Bead One, Pray Too: A Guide to Making and Using Prayer Beads.” Winston also has a blog. I think I’d heard of her book before, but it definitely wasn’t on my short list of craft books I wanted to buy. Let’s get something out in the air here. I was raised Catholic. This might sound silly, but I still consider myself Catholic, even though I disagree with a lot of the things the church teaches. Really fundamental things. In fact, there are probably non-Catholics out there who are better aligned with the Catholic church than I am. In a nutshell, I just don't think there's ONE right answer. These days, I fall into what most people would call the “spiritual but not conventionally religious” camp. I talk to my daughters about all religions and about God. When an ambulance goes by, we say a prayer for whoever may be in pain and for the people who love that person. At the end of the day, we talk about all the blessings in our lives. I don’t go to church often, but when I do it’s to a Catholic one. It’s where I feel most comfortable. I think a big reason for that is the consistency of the mass. A lot of visitors to Catholic churches feel uncomfortable with all the up and down and recited prayer, but to me the sameness is meditative. Just like saying the Rosary is meditative. It brings you into a peaceful state. I really should do it more often. She writes about the history of various religions’ prayer beads and gives instructions for making them. Here are her directions for making a basic Anglican rosary, via Craftsanity. 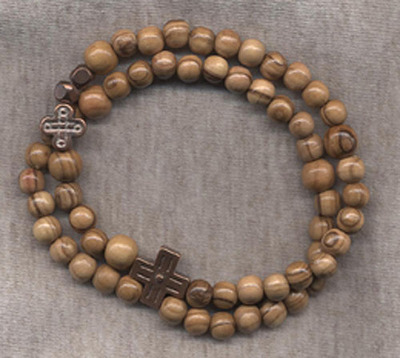 She suggests that prayer beads can be for anyone, regardless of whether your faith has a name or not. If people aren’t comfortable with a crucifix on the end of a strand, replace it with a tree or other nonreligious symbol, she says. No doubt the very thought of that will offend folks. But c’mon. What’s the big picture here? If beads can help people pray and praying helps slow people down and slowing down makes us more peaceful and being more peaceful makes the world better for everyone, does the symbol really matter? Winston and Ackerman-Haywood discuss it more eloquently than I can here, but I walked away (limped, really) from the podcast enlightened—and wanting to get my hands on that book. Oh, I am so with you on the "spiritual but not traditionally religious" POV. We don't formally practice any sort of religion. We hope that by being open to many different viewpoints that we'll provide our child(ren) the opportunity to explore what means the most to THEM. I know I'll never go pure Catholic again - it's how I was raised from a young age and I resented having it forced upon me. Maybe an early sign of the rebellion and independence of the iGeneration? Not sure! Dear Megan. You humble me. I am actually in tears over what you wrote about my book. You get it. And you remind me why I wanted to write the book in the first place - why people of all traditions need to reclaim prayer beads. Thank you so much for your lovely words. You may not change the world, but you have touched me very deeply. Wow! Thanks so much for taking the time to pop in, Kimberly, and leaving such a wonderful note. I saw the nice post on your blog, too. I'm really touched. And thanks for dropping me a line, too, Caitlin. It's good to hear from someone who can relate. I read your blog often and love the work you do! This post, on the other hand made me sad. I have an issue with the church.... people don't go for the right reason. We live in a society that is very "me" oriented. It's all about what we can get, what we deserve and how it makes us feel. Even giving is about how we feel. The problem with that is simple, we should be going to church because God is amazing. Church and Christianity shouldn't be about what we get, but what we give. God made this world for us... a beautiful place full of HIS art! Why wouldn't we want to give Him our all? It isn't about us and how we feel, but Him and how amazing He is! The Bible is clear, however, that the road to Him is narrow...one right answer. To this I say, Amen.